Purpose: To protect the innocent (of any creed) and defend the Jewish way of life. 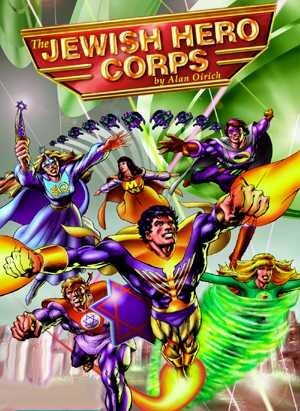 History: (Jewish Hero Corps CD-Rom comic "The Amnesia Countdown") The Jewish Hero Corps are formed by Menorah Man to prevent the villainous alien Fobots from using "Forget-me-Chips" to erase Jewish memories. ("Continuity - A Crisis in Time" comic, Electric Comics in conjunction with Leviathan Press) The Fobots ally themselves with the Apathons to use a time travel device, known as the Zmonitor, to try and erase the Jewish Hero Corps from history by preventing each of their origins from occurring. The heroes are forced to pursue the Fobot agent Haman through time from ancient Persia into the 20th century. Comments: Created by Alan Oirich, with soundtrack done by Steven Oirich (remember, the characters first appeared on a CD Rom), and art by Michael Netzer. Check out the official website. Image on this page very kindly supplied by him (and remains his copyright).